This is what I call a bowl of happiness. It’s the sort of light, crisp, insanely fresh dish that automatically makes you smile. 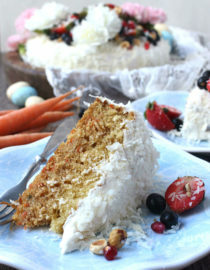 Not to mention it’s gluten-free, crazy easy, and ready in less than 30 minutes! 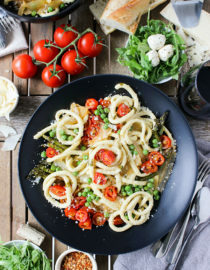 Spiralized vegetables have been trendy for a while now, and with good reason. An effective way to mimic the joy of pasta without all those messy, bikini-killing carbs, vegetable noodles are pretty amazing. But prior to a few weeks ago, I was doing the unthinkable: BUYING THEM from my local grocer. I know, I know — the shame is real. Because not only are spiralized vegetables SO EXPENSIVE (hi, I’m broke), with the right equipment they’re ridiculously easy to make. 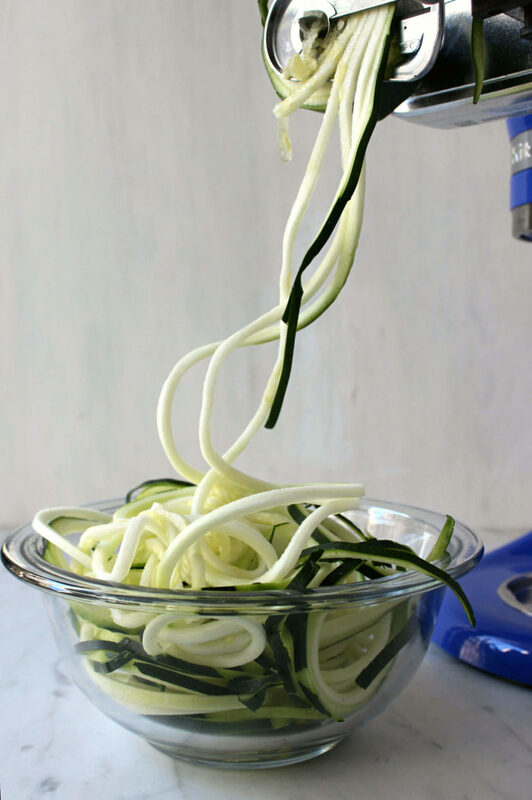 That equipment being the KitchenAid® 7 Blade Spiralizer Plus™ with Peel, Core, and Slice. As someone fully equipped with a KitchenAid kitchen — oven, fridge, AND dishwasher! — I’ve been a devoted fan for years. 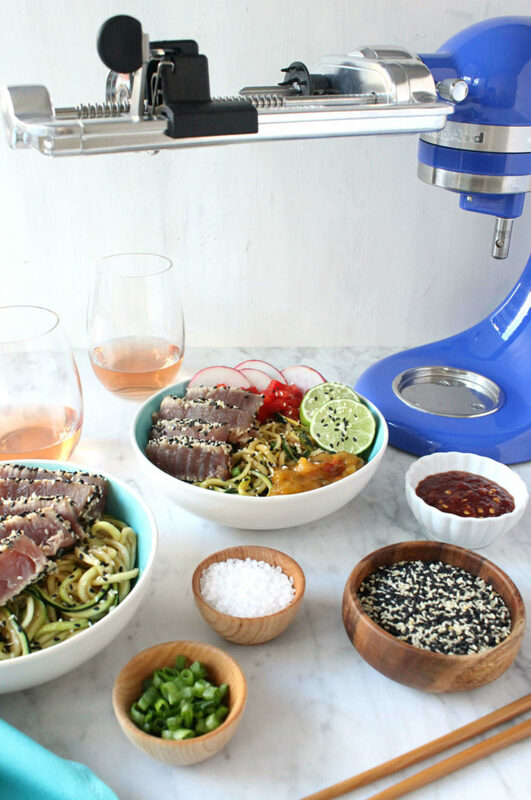 But the spiralizer attachment has truly been life-changing. 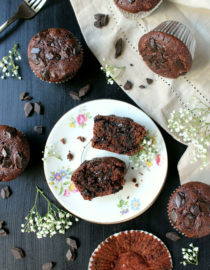 Connected to the KitchenAid® Artisan® Mini Stand Mixer (another obsession), the assembly takes just a handful of minutes, the instructions are a breeze, and the performance? Golden! 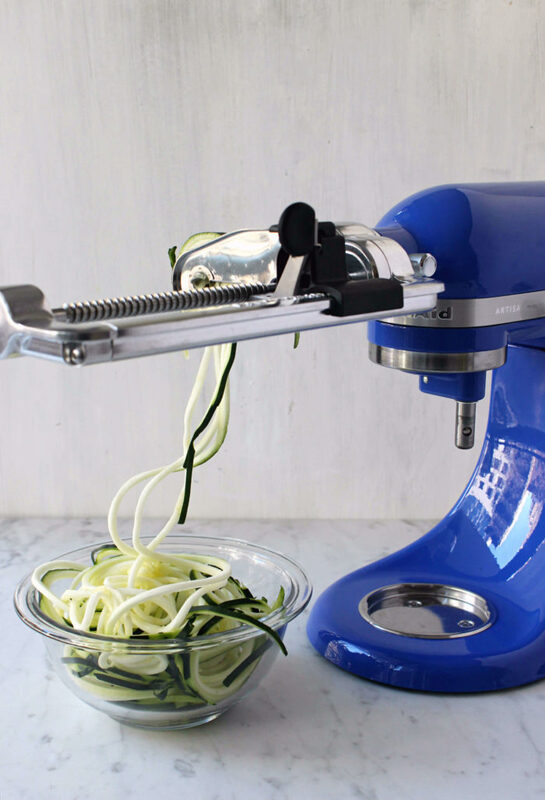 With a variety of blades to handle all your spiralizing needs, this baby shreds up zucchini, apples, squash, and more in just seconds. 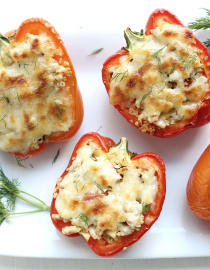 It’s efficient, it’s space-saving, and it leads to insanely delicious meals like this. You start by making a sweet ‘n spicy vinaigrette made of soy sauce, rice vinegar, sugar, and hot chili paste — Just a few quick whisks and a world of flavor is born. Next prepare the zoodles, which luckily are as simple as the sauce. When spiralizing I prefer using the medium-sized blade for noodles reminiscent of bucatini, but feel free to use whichever size you like! 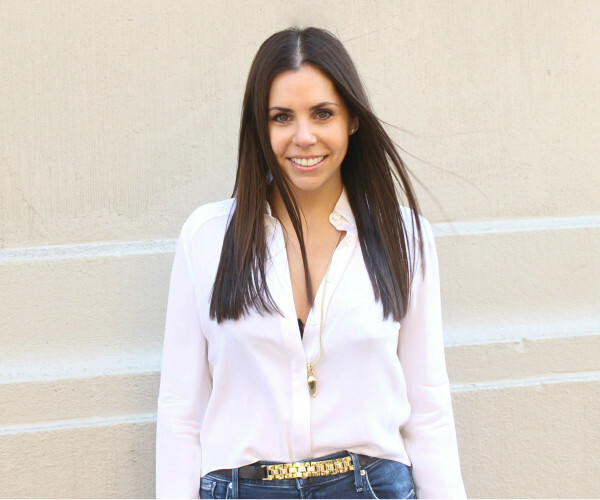 The perfect twirl is subjective, so do what feels best. Whatever you choose, cut the zucchini into manageable, 5″ long sections — I used a mix of green and yellow — thread on the core skewer, then spiral away! In no time you’ll be staring into a sea of healthy, swirly goodness. 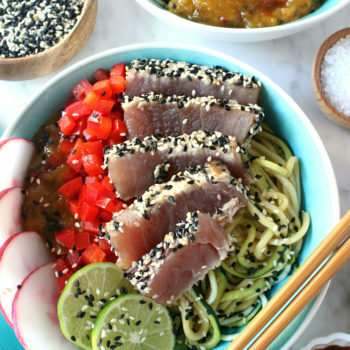 To make the fish, gently press sesame seeds into wild caught ahi tuna, then sear for 1-2 minutes on either side. I like my tuna rare, so I seared mine for only a minute. But if you’d like yours more well done, stick to 2-3 minutes! Cooking is all about accommodation, so adjust how you must. 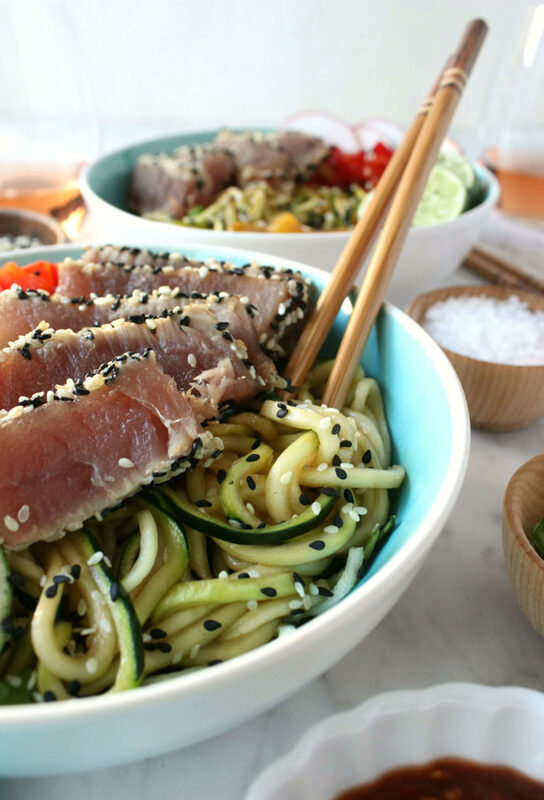 Once the tuna is cooked add the zoodles and about half of the sweet ‘n spicy sauce to the pan, then quickly sauté until just tender. 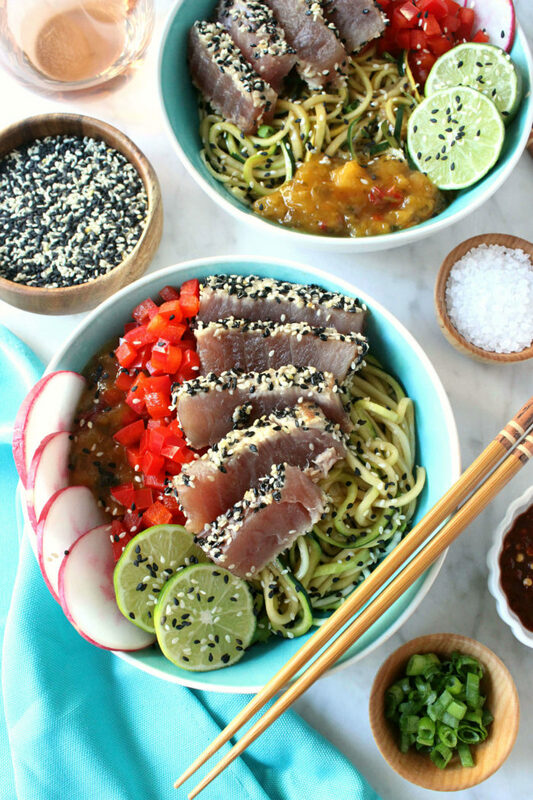 Use tongs to evenly distribute the zoodles between two bowls, then top with the tuna, diced bell pepper, scallions, edamame, bok choy, whatever! The veggies are really up to you, just make sure the presentation looks fabulous. Obviously the taste here is insane — flavor + freshness to the MAX — but it’s the texture that really brings the dish home. 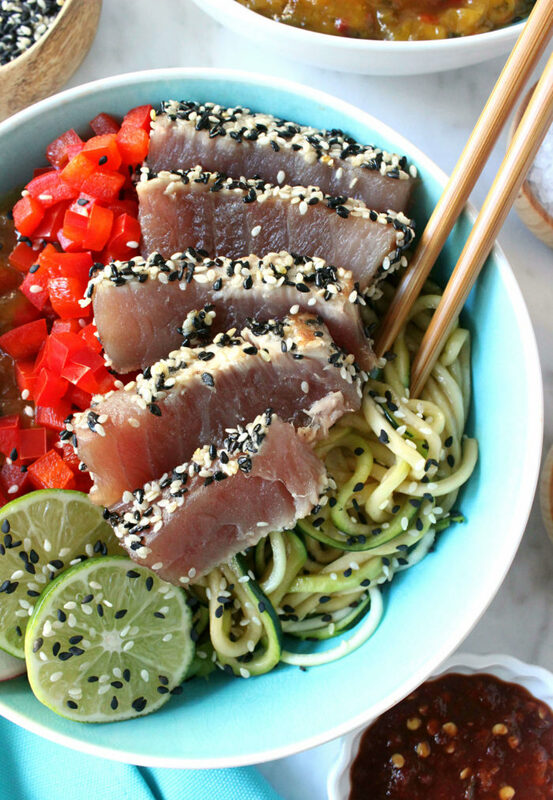 I love how the fat, chunky zoodles lap up the robust vinaigrette and stand up to the nutty, savory tuna. A touch of crunch (radish + bell pepper), a hint of sweet (mango), and a punch of tang (lime!) create perfect, bowl-building harmony, so follow this guideline when customizing your own. And obviously, pairing with your favorite pink juice — lemonade, rosé, champagne?! — is always a good idea. In a mixing bowl combine the olive oil, rice vinegar, soy sauce, chili paste, garlic, sugar, and ginger, whisking well. Start with 2 tsps of chili paste, then add a third if you want more heat. Attach the 7 Blade Spiralizer Plus™ with Peel, Core, and Slice, and Slice to the KitchenAid® Artisan® Mini Stand Mixer, fitting it with the medium-sized spiralizing blade. Center one zucchini section on the fruit and vegetable skewer, then secure to the core of the spiralizing blade. 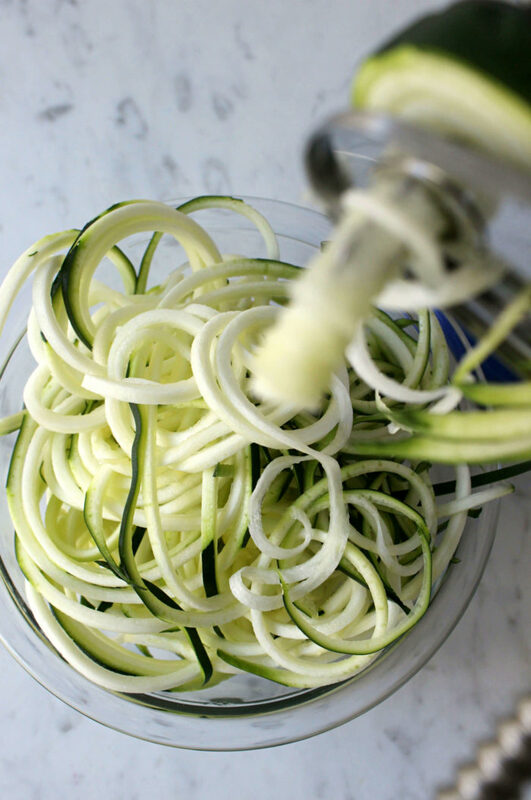 Place a bowl under the attachment to catch the spiralized zucchini, then slow turn the stand mixer speed from stir – 4 until the zucchini is finished. Repeat with remaining zucchini. 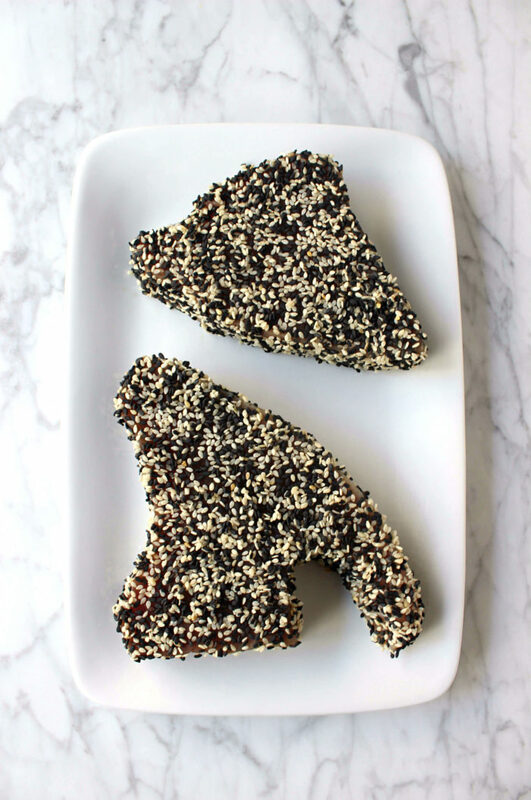 On a cutting board gently press the sesame seeds into the tuna, coating on all sides. Next, heat a skillet over a high flame until hot (about 1 minute), then add the sesame oil, swirling to coat the bottom. Sear the tuna for 1 – 2 minutes on either side — I prefer mine rare, but cook yours as needed! 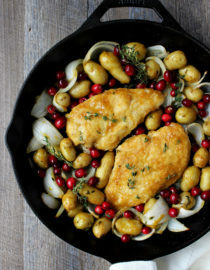 — then remove from the skillet to cool. Reduce the skillet flame to medium, then add about half of the soy vinaigrette. Add the zucchini noodles to the pan and sauté for about 2 minutes until just tender, then transfer equally to two bowls. 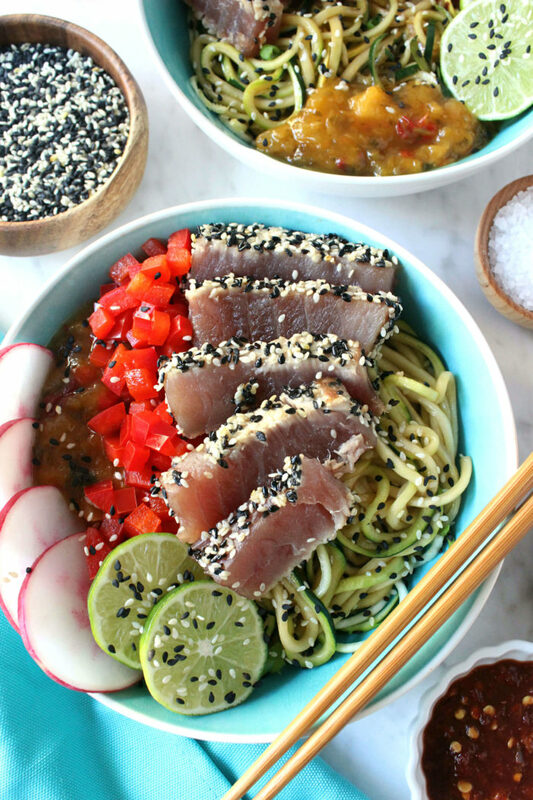 Slice the tuna, then serve on top of the zoodles with the radish, bell pepper, and mango chimichurri if using. Serve immediately, pairing with the remaining soy vinaigrette on the side for dipping.